I am pulling together team members from some of my previous site-specific productions at the Old State House and the MIT Museum, where we created Blood on the Snow and Both/And. 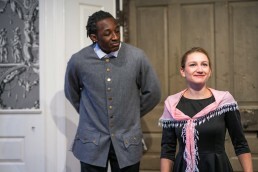 One of the first for Plays in Place projects was the production of Cato & Dolly, a new one-act play for the Old State House in Boston which ran for 112 performances in the summer of 2018. The next big project is the production of two series of site-specific plays that will run in June and September of 2019 at Mount Auburn Cemetery in Cambridge, MA.